Dal is the most important staple food in India and Nepal. A lentil curry is frequently eaten with flatbreads such as rotis or chapatis or with rice, a combination referred to as dal bhat. 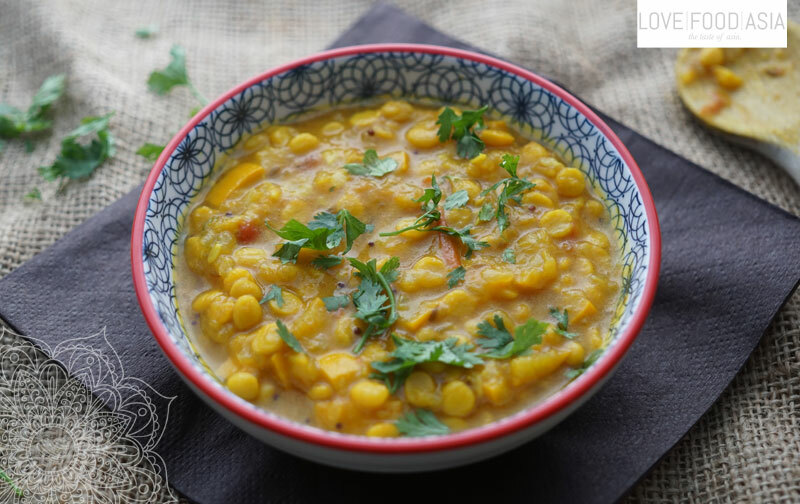 In our version we´ve mixed a traditional Chana Dal recipe with tomatoes and yellow zucchins. You will get a creamy consistency after cooking this vegan dal where we used very simple ingredients. Sometimes less is more. Soak chana dal in enough water for 1 hour. After 1 hour, transfer dal to a pot and add water. Add diced zucchini, turmeric powder and salt. Stir to combine. Close pot and cook on high heat for 10-15 minutes. Add oil to a pan on medium heat. Once the oil is hot, add cumin seeds and mustard seeds and let them crackle. It’s important to wait until mustard seeds pop. If they don´t they will taste bitter. Now add asafoetida, chopped green chili and chopped ginger and saute for a few seconds. Add chopped onion and cook for 2 minutes or until onion starts turning light golden in color. Now add chopped tomatoes and cook for 5-6 minutes or till raw smell goes away. Also add salt to taste. Add cooked chana dal and zucchini to the pan and mix.Simmer dal on medium heat for 5 minutes or till it comes to a boil. You can add more water at this point to adjust the consistency of the dal to preference. Garnish zucchini lentil curry with fresh coriander / cilantro, squeeze in some fresh lemon juice and serve zucchini chana dal hot with rice or roti.